Members get a $20.00 discount on this item at check out. When someone we love dies, our lives are changed forever. The pain and sorrow we feel seems as if it will never end. In this therapeutic, new video presentation you will see and hear others discuss what you are going through right now. You will learn how to let yourself walk through your grief without letting it overwhelm you. 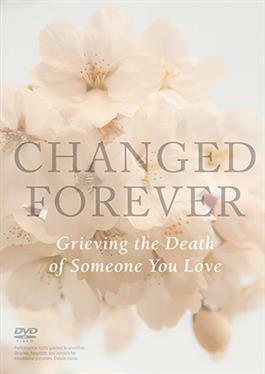 Testimonies of people who have recently experienced the death of a loved one, as well as experts in the field, talk about how to slowly integrate the loss you have experienced, and the grief that comes with it, into a life that is changed forever. Robert Zucker, MA, LCSW, Fellow in ThanatologyGrief counselor, writer, consultant, and teacher. Robert has been specializing in the area of grief and loss for over thirty years. Heather L. Gary, MSW, LICSW, PsychotherapistWorks in individual and family therapy, grief therapy groups for adults, educational seminars on grief and loss, as well as grief workshops. Monique Cerundolo, MA, BCC, the Hispanic Staff Chaplain, Brigham and Women’s Hospital Chaplain, Boston, and a member of the Boston Chapter Maryknoll Affiliates.